Oil enamel on canvas (21 1/2" h x 29 1/2"w) (55 x 75cm). Oil enamel on canvas (271/2" h x 19 3/4"w) (70 x 50cm). Oil enamel on canvas (18" h x 18"w) (45 x 45cm). Oil enamel on canvas (22" x 30") (56cm x 76cm). Oil enamel on canvas (14" h x 12"w) (35 x 30cm). 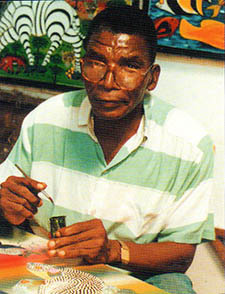 Omary Amonde, c.2000 (photo courtesy of Yves Goscinny in Art in Tanzania 2000). Amonde was of Makua ethnicity, a cousin of Tingatinga, born in Nakapanya, Tunduru district, in the Ruvuma region of southern Tanganyika. In 1960 he came to Dar es Salaam and found work as a gardener near the Oyster Bay Hotel. He worked for a number of years in the city of Tanga, returning to Dar es Salaam in 1972. He was inspired by the success of his cousin to take up painting. He was Tingatinga’s last apprentice, working under the master for only a short period before the master’s tragic death in 1972. Omary Amonde stayed in Dar and continued to paint for the rest of his life. He was one of the original members of the Tinga Tinga Cooperative, and in recent years was the president of the group. His work is very sought after and has been widely collected and exhibited abroad, particularly in Japan. Omary Amonde passed away in February 2015. His work is very sought after.